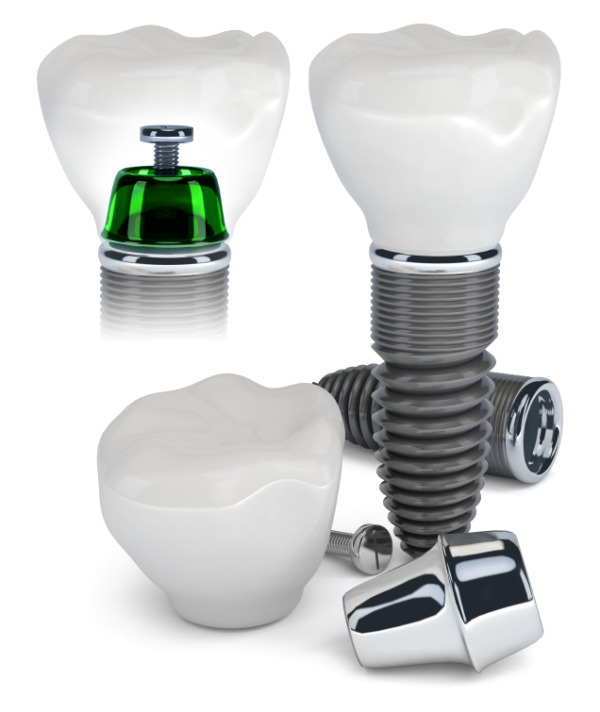 Dental implants are a durable and functional solution to missing or damaged teeth. Unlike dentures, implants work by fixing an anchor into the gums, much like a natural tooth root, making them a permanent alternative that can be treated like original teeth. There are no dietary restrictions involved, and they look spectacular when properly installed. Best of all, as permanent fixtures, implants can prevent bone loss by keeping the natural spacing and form of the smile intact. Dr. Parminter and our implant dentistry practice can help patients from Whittier and beyond determine if they are a candidate for this procedure. As with any procedure, implants are not right for everyone. Before proceeding, we want you to know some risk factors. Patients who suffer from osteoporosis or take prescription steroids for any condition might have difficulty. Smokers might also run into trouble because smoking increases the probability of contracting post-implant diseases such as peri-implantitis. If these or any other risks apply to you, we'll discuss your options and help you decide how to move forward. Once we have determined that you are a candidate for implants, we'll do a thorough, two-dimensional scan of your mouth, create a mold that's a perfect representation and formulate a plan for precise implant placement. The process, from planning to healing from oral surgery, generally takes several months to complete. As a implant dentist serving the Whittier community, Dr. Parminter is dedicated to matching the right implants to the right patients; your comfort and long-term success are our chief aims. • A rod – Surgically placed in the jaw, this screw-like component is typically made of titanium, which is naturally compatible with bone and fuses where implanted to create ultimate stability. • An abutment – A connector that is attached to the portion of the rod that remains above your gum line and houses your crown. • A dental crown – Custom made to match your smile, your new crown sits on top of your implant for a fully-functional and seamless smile restoration. Our Whittier dental implant team is happy to help you get the permanent teeth replacement you need to restore a healthy smile and full bite function. For more than 20 years, we've helped each patient with his or her dental problems. We treat each case as unique and offer each patient personalized service designed to be as stress-free as possible. The four dentists on staff with us, combined, hold memberships in the American Dental Association, the Academy of General Dentistry, the California Dental Association and the San Gabriel Dental Association. With an anesthesiologist on staff, we offer the option of local or general anesthetic when you undergo implant procedures or other dental surgery. One of our staff is an oral surgeon with a MD degree from the University of Texas Health Science Center San Antonio, TX, so you can consider our office to be a one-stop shop for all your dental needs, not just implants. We're in the office Monday - Saturday, 8:00am - 5:00pm, and take lunch from 12:00pm - 1:30pm. We have a female dentist on staff, Dr. Charlanne Holman, and members of our team also speak Spanish to accommodate non-English speakers. Contact us by phone, email or in person to learn how getting dental implants in Whittier can help restore your smile . Once you get to know us, you'll feel like family.